For adoptive parents, just the idea of talking to your child about adoption can be overwhelming. How will he or she react? Will it hurt your bond with your little one? What types of questions will follow as he/she grows? When should you start the conversation? There is a seemingly endless stream questions and conversations that are required throughout any child’s upbringing. Adoption only adds to the many emotional talks. Adoptions With Love understands your hesitation. Know that we are here to help you navigate important adoption conversations as your child grows. Each phase of life brings a new series of questions from your child. It is important for parents to know how to respond in age-appropriate language, with honesty and compassion at every step of the way. No matter the circumstance, an open, honest dialogue about adoption is always best for the child. In fact, over 97 percent of adopted children over the age of five know they were adopted, and 90 percent of these children have positive feelings about their adoption experience. The tried-and-true rule to talking about adoption is to start early. Start adoption conversations in infancy and keep them going over the years, as your child grows. In this blog, Adoptions With Love offers advice on how to talk about adoption with infants, toddlers, and young children. From the very first day you welcome your child into your lives, you can begin telling his or her adoption story. It is never too early to start using the word “adoption,” whether it is during a bottle feeding or bath time. As a baby, your child will not grasp what you are saying, but this practice can help you gain more comfort using the language. Adoption is something that you will continually discuss, intermittently, throughout your child’s life. Getting comfortable with “the talk” now will greatly benefit you both down the road. Another reason it is so helpful to start the adoption conversation early on, is that when the time comes, your child will be more comfortable with (and confident in) his or her adoption story. Your little one will be used to the words and will not be shocked or caught off guard when his or her peers start asking questions, too. Remember that young toddlers and children have short attention spans, so they do not require lengthy conversations to address the topic of adoption. They also think of things as black-or-white, and do not yet have the ability to understand metaphors or unclear “grey” areas. In the early years, use simple, straight-forward language to talk to your child about adoption. Save the more complex details for the later school-age, preteen, and adolescent years. In addition to having simple conversations early and often, it is also important to be mindful of the language. Keep things positive! It is important to always send the message that the adoption is a positive, loving way to grow a family, and that is how you and your child came together. Always smile when sharing your child’s story and when talking about his or her birth parents. Young children catch onto emotions, even when they cannot fully grasp the words. By using a positive, compassionate tone, you will help your child understand that adoption is positive piece of your lives. Your child will be happier and more confident in his or her adoption story if you portray it with pride and happiness. New parents may be pleasantly surprised to learn that it is quite easy to discuss adoption with a baby. This tiny, beautiful miracle looks to you only for love and care. You can start with simple phrases during bath time and bedtime, saying things like: “Daddy and I love you! We are so happy we got to adopt you!” and “We are so grateful for Susie” (use the birth mom’s name, or a name/title you have chosen together to call the birth mom. Using “mom” can be confusing to a young child). You may also just incorporate the word “adoption” into your day-to-day conversations. This way, your sweet baby will always be comfortable with the word and attach a positive feeling toward the subject. “Mommy and Daddy were so happy to adopt you. Mommy and Daddy could not grow a baby in mommy’s belly. Susie grew you in her belly, but she was not able to take care of a baby at the time. She loved you so much and wanted to make sure you had the best life, so she chose us to be your parents forever. Babies need to be taken care of, given food and clothing and a home. Susie couldn’t provide this all (for adult reasons), so we adopted you when you were born. And you have been our sweet baby from the day you were born (or adapt the story to your situation).” You may also tell this in storybook, “Once upon a time…” form at bedtime – Young children love hearing stories about themselves! If, and when, your youngster begins asking more questions around the adoption, you should feel free to address them simply, honestly, and positively. For example, if your child asks: “Why does my skin look so different?” Just simply say: “We usually look like our biological families. You have skin like Susie (insert name, if you know it), and I have skin like Grandma. But we are all family and love each other, forever, no matter what we look like.” This will give your child the answer he or she is looking for, while redirecting the conversation toward a happy feeling of belonging. While many young children frequently ask questions about adoption, there are some who stay quiet. This is normal. It is still important for you, as the parent, to encourage these conversations. You can take out pictures of the day you met them and laugh about how cute they were. This sometimes stimulates conversations. There are many adoption-themed books and kids’ shows that can help address the subject. Parents may consider using these to child understand more about his or her story, in a relaxed and comfortable manner, as well as relate it to others’ adoption stories. Another helpful resource is Adoptions With Love. Our caring staff are available to help adoptive parents and hopeful parents through the adoption process. For more information about talking to your child about adoption, please download our free guide below. 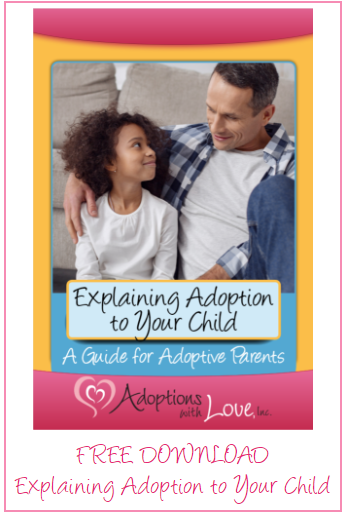 “Explaining Adoption to Your Child: A Guide for Adoptive Parents” is designed to help you find the right words, and answers, at each stage of your child’s life – starting in infancy and throughout adolescence. For any more questions, please email us at info@awlonline.org.